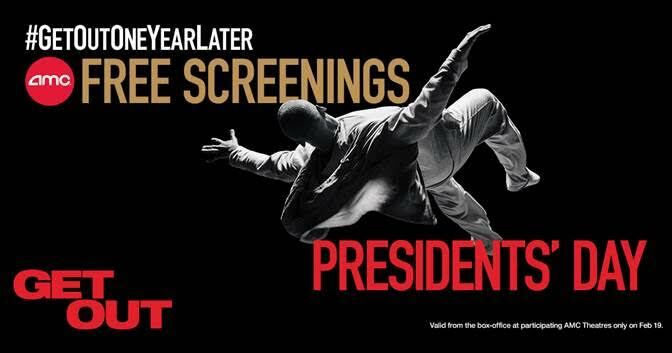 Jordan Peele and Universal Pictures offer fans free tickets to special Presidents’ Day screenings of four-time Academy Award®-nominated GET OUT at 55 AMC theatres nationwide. Each guest who requests a ticket the day of the screening—at a participating location—will be given one free admission to the 7:00 p.m. showing on February 19, up to theatre capacity. Find participating locations and more information here: http://www.getoutoneyearlater.com. The promotion will be available at each of the 55 AMC Theatres playing the special screening of Get Out at 7:00 p.m. on February 19. Free tickets will be available on a first-come, first-served basis and may only be picked up at the AMC box office that day. Each guest must present a valid ID to receive their ticket, with a limit of one free ticket for each ID presented, while supplies last. This offer is valid for the 7:00 p.m.showing of the film on February 19, only. To find out more information, visit www.getoutoneyearlater.com.